We are headed to Shelby Farms this morning for a bike ride so I decided we needed some fuel! We are also sitting here watching Cast Away and Wilson just floated away. I literally can't take it... That's one of the saddest scenes in a movie ever. I told Tres to turn it off because I get my feelings hurt so bad but he's torturing me. Anyway, back to the eggs... 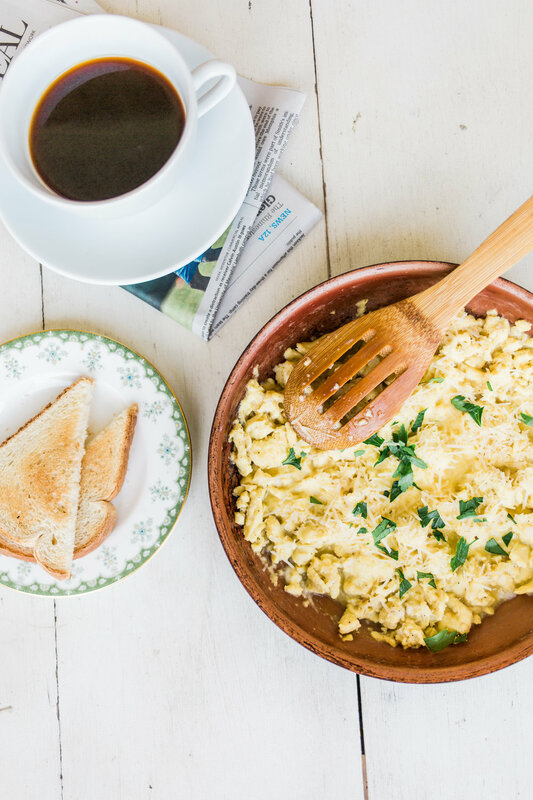 There's nothing like scrambled eggs for great protein! I've mastered the perfect way to cook them, and I think you should give it a try. Let me know what you think! 1. Heat butter over low heat. While butter is melting, beat eggs and heavy cream together with a fork in a large bowl. Beat well and for several minutes until eggs are well combined, fluffy, and light yellow in color. 2. Pour eggs into pan and sprinkle with about 1 tsp of salt and 1/2 tsp pepper. As the eggs cook, gather from the sides with a nonstick spatula and push into the middle of the pan. Let them cook low and slow like this, continuing to push cooked eggs into the middle of the pan, until eggs are cooked and fluffy. 3. Plate and sprinkle liberally with Parmesan cheese and herbs.